A few years ago (2010 – 2012) I participated on huge predictive modeling project of settlement patterns in Eastern Bohemia due to planned motorway civil engineering project. One of the data sources for the model were the results of surface sampling along the path of the future motorway. I finally jumped to my dissertation about this by chance. The sampling was performed along the motorway project exclusively – along the axis at lemgth of 37 km and width of 50 m (fig. 01 on lidar shaded terrain background); in a quite monotonous landscape of eastern Bohemia (fig. 02). Generally speaking, the whole shape of sampling trajectory is not optimal while I would prefer more “quadratic shape” – to give more to width and less to length. The danger of the shape is clear from fig. 03. Presuming the hypothetical regular settlement network (blue dots) there is a good chance to avoid that and to get an empty result (this should be elaborated a little more by sampling theory with the basic question: “how reliable is the sampling of this shape”). Another negative element is the non-random nature of he trajectory (avoiding the current inhabited areas). And for the third – although the extent of 37 km seems colossal, regarding the width of 50 meters we get only 1.45 square kilometers, or the square of a side less than 1.2 km; or even worse – the blue rectangle on fig. 03 is covered only by 0.24%. And that is not reason to be enthusiastic…. Fig.01. 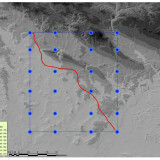 The trajectory of the R35 motorway project on the LIDAR terrain backround. The noodle in space. Fig. 02. Monotonous agricultural land of eastern Bohemia. The footprints on the surface are from the sampling crew. Fig. 03. Hypothetical settlement (blue dots) could be missed completely by the “random” trajectory. The area is almost completely under the plough, the eastern Bohemia is an arable Czech granary (Figs. 04-06 show the trajectory on maps section from 1850 until now). This allowed us to hope we would continuosly collect the artefacts on the field surface. The whole trajectory was divided into sampling polygons to a) divide the space into smaller analytical pieces and b) to respect the fields boundary (the idea is that different surface nature allows different artifacts visibility so we tried having the one polygon of the same visibility value). You could see the polygon numbering and delimitation on fig. 07. Approximate length of a polygon was 100 m and the approximate area somewhere about 4200 square meters. And now the important thing – we walked/collected this trajectory 4 times in different vegetative (agricultural) seasons: autumn 2010, spring 2011, autumn 2011, spring 2012. Of course we could not sample all 373 polygons in all seasons due to surface conditions (still growing and dense vegetative cover, not accessible etc…) but 222 that are of my eminent interest. are used mostly for formalised description of polygon surface characteristics and data output consistency. It was obvious from the beginning that the visibility of the surface would have the decisive role in the quantity of finds so keeping this kind of record should be of an eminent interest. While the finds type (pottery, stone etc…) and its dating is not important for the evaluation of the ertifact scatters, we have been collecting everything of artifactual nature. Fig. 10. The sampling team (gender balanced). Fig.11. Terrain forms describing one of the sampling polygons. 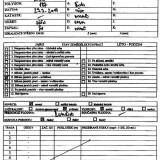 Slightly adapted from M. Kuna’s forms. práve čítaš diss 01. Surface sampling on R35 motorway project v ďobo-CADzone, true men don't kill coyotes and use AutoCAD….